Cathy Kangas, of New Canaan, is helping to raise funds for Nowzad Dogs, a charity that aims to build shelters for stray and injured animals in Afghanistan and Iraq. Cathy Kangas was well aware of the human toll of the war in Afghanistan, but it wasn't until she read Pen Farthing's book, "One Dog at a Time: Saving the Strays of Afghanistan," that she learned of a lesser-known tale of suffering. "While no country is free of animal cruelty, it's really horrible in Afghanistan," said Kangas, of New Canaan. "The conditions are deplorable." In his book, Farthing, a retired UK Royal Marine, speaks of his outrage during a tour of duty in Now Zad, Helmand Province, where he witnessed countless dog fights resulting in terrible injuries to the feuding canines. Hunting for scraps of food and hiding from the hot desert sun only adds to the misery, Farthing writes. A lifelong animal lover, Kangas is helping to alleviate the problem by raising money for Farthing's charity, Nowzad Dogs. The goal: to build animal shelters to care for stray and injured dogs in Afghanistan and Iraq and hopefully, to find them loving homes. "I felt so drawn to this cause of this one Royal Marine and I wanted to do something to help," said Kangas, who met with Farthing in October to discuss the partnership. Kangas, the founder of PRAI Beauty, a global skin-care business, is raising money through Beauty with a Cause, the company's philanthropic division. Coupled with Farthing's fundraising in Europe, a makeshift shelter has been built, staffed and equipped in Now Zad. Kangas' support of Nowzad Dogs is a natural extension of her work with the Humane Society. 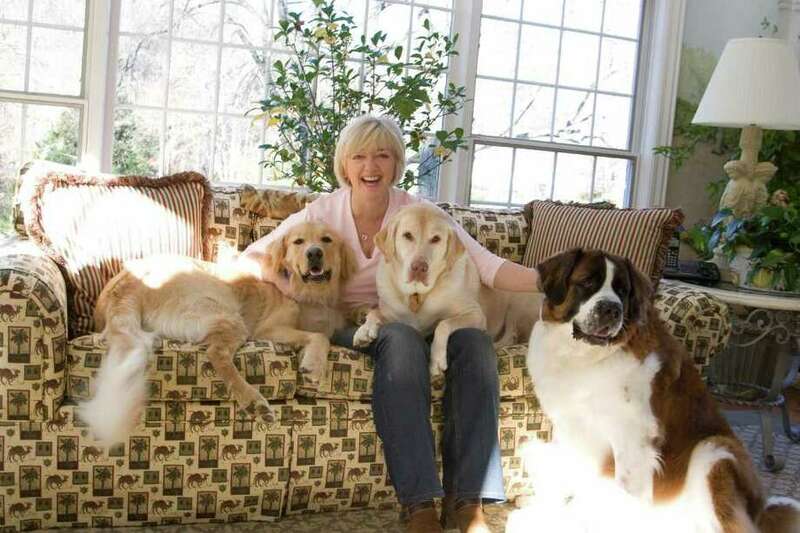 A member of the national council of the nonprofit organization, Kangas cares for four rescue dogs -- T.J., a yellow Labrador; Jay, a golden retriever; Maggie, a St. Bernard; and Mene, a Russian borzoi. She also has been involved in efforts to pass animal cruelty legislation in Congress. However, such a policy is unlikely to see the light of day in Afghanistan. "Dog fighting is more popular there than the NFL is in the United States," she said. "Every corner, every hour, people are sitting around watching dog fights. It's a national sport." And when dogs aren't thrown into the ring, they are used as target practice. What's more, programs to reduce the stray population by poisoning or shooting have proven ineffective. Marcie Patton, a professor of politics with a focus on Middle Eastern studies at Fairfield University, said that war has turned the problem into a pandemic. "All throughout the Middle East, there's packs of wild dogs running around," she said, adding that the war in Afghanistan has prompted massive displacement, leading local herders to abandon their canine companions. In Now Zad, Farthing was exposed to this harsh reality. His unit came across countless dog fights -- hoardes of men screaming for blood as growling canines fought to the death. One dog had had it's ears and tail chopped off and Farthing, feeling sympathy for the injured animal, took him in. He named him Nowzad. "He became one of my buddies," said Farthing, adding that many NATO soldiers in Afghanistan and Iraq have made friends with dogs, and in some cases, brought them back to their home countries. But Farthing is not only driven by a sense of compassion -- the stray dog population is out of control, creating a health risk to the Afghan people, he said. Farthing's shelter plans to introduce a trap neuter release policy to address the issue. While Kangas and Farthing want to open new shelters in other parts of Afghanistan -- and eventually, in Iraq -- challenges persist. For one, the pricetag for operating and enhancing the shelter in Now Zad is $35,000 a year; building a new one costs $40,000. They then have to win the hearts and minds of the Afghan people. According to Patton, many Afghans have enough trouble feeding themselves, let alone pets. And dogs are generally viewed as "unclean" in the eys of Islam. "It's not a pet that you bring into a house," Patton said. "A dogs' purpose is to protect the household, or to herd. Otherwise, it's wild." Kangas and Farthing are hoping to change that perception through an extensive public awareness campaign. As Kangas explained, the way socities treat animals is far more telling than most people would like to admit. "It tends to reflect how we treat people, and treat the underdogs in our own societies," she said. "Whether it's people or animals, they deserve respect." For more information and to donate, visit www.nowzad.com.